Post #1959: Even if the apocalypse doesn’t arrive…. 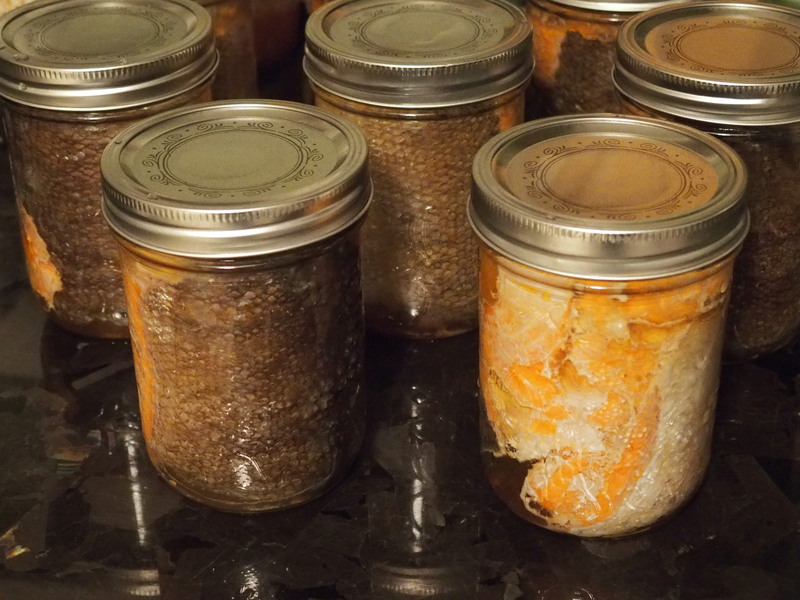 These cans are full of sockeye salmon from the Johnstone Strait – my first go at pressure canning after years of extensive water-bath canning. My basement has a special corner just for preserved foods – jams, pickles, wine, liqueur, spiced fruits and many other fabulous things. I got into food storage in a serious way because I was preparing for the urban collapse I was sure would one day arrive. Now I do it because I love having so much great, well-made food on hand year round. Love is a much better motivation than fear, and we eat really well around our place. Ah, I am so jealous. I would really like to secure better access to salmon. We were part of a Community Supported Fishery, but we can’t afford it this year.